There are techniques that can help you learn, practice, and polish your English. These techniques usually are carried out in a classroom, among friends or individually. These techniques, more often than not, include exercises like reading a newspaper or a book loud, speaking in front of a mirror, practicing pronunciation and fluency, etc. However, have you ever wondered how much these exercises really help? We are not saying that these exercises are of no use, they definitely are. If not for these exercises, how else would you even learn new words, phrases, and idioms? How else would you learn the principles of grammar and other rules of the English language? These exercises are definitely a stepping-stone for a person who wishes to learn and speak English. However, practicing English in a classroom, and speaking English in a real-life situation are two very different things. As important as it is to practice English speaking, it is even more important to implement the same in real-life situations. This will help you in gauging how much you have learned and how much you need to improve, the areas you need to work on, and what are your problem areas. This is why we bring to you a series on 'situational conversations'. This is where we give you a real-life situation and the type of conversation you can encounter. While no one can predict how a conversation shapes, there are a few standard sentences exchanged in certain standard situations. Conversation in a restaurant while ordering food. Waiter: Welcome to FoodRUs, what kind of table would you like, ma'am. Customer: A table for two, please. Waiter: Here are your menus. What kind of water would you prefer, bottled or mineral water? Customer: Thank you. Mineral water should be fine. Make it chilled, please. Waiter: Here is your water, ma'am. Waiter: Are you ready to order, ma'am? Customer: Yes, we would like to have pasta with sautéed vegetables and spicy chicken soup. We will order our main course later. Waiter: Anything else ma'am, as a side dish? Customer: This should be fine for now. Waiter: Here is your pasta and here you go, your soup. Enjoy your meal. Bon Appetite. So, as you can see, when ordering food in a restaurant, keep the conversation short, clear, and crisp. 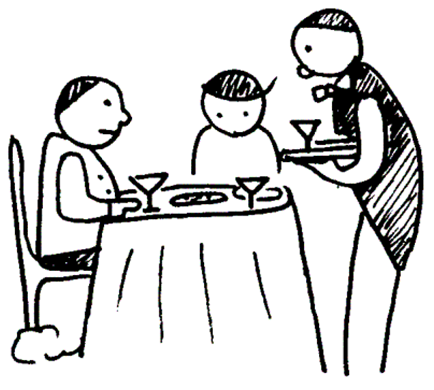 It is also important to be on your best manners when dealing with the waiter. And smile – do not forget to smile. Going to a restaurant means that you are about to have a good food experience, and a good, polite conversation will set the right mood! For more such valuable and handy spoken English tips and tricks, it is vital that you sign up with our online English speaking classes. Fluent English speaking takes practice and patience, and with the right guidance, you can surely improve spoken English. Learning and speaking English is a requisite for excelling in today's world, and with the help of the right English classes, you can achieve the excellence in English speaking.